Don't Feed My Monkeys: Goodbye, Jake. You've been a good dog! ﻿﻿Today was a hard day. 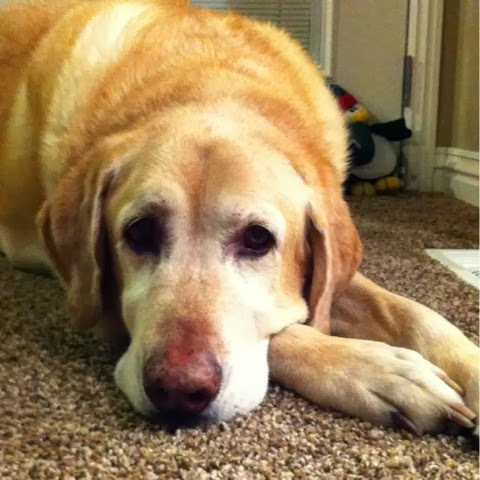 Today we said goodbye to our dear yellow lab, Jake. If you are a pet owner, you understand what I am going through. People who don't have pets of their own often say, "It's just a dog." Well, he wasn't "just a dog." He was our dog and a member of our family. We treated Jake like our child for the first few years. He was, after all, our first baby! We spoiled him rotten with Christmas gifts and dog-friendly birthday cakes. We often took him for rides and went to the dog park regularly. He was my jogging partner, and we went on countless walks. Jake wasn't too sure about adding members to our family. He did okay with the addition of Bubs, but each additional child caused him a bit of anxiety. He refused to eat for at least a week after each child was born. He even licked himself raw (and left a scar) on his hind leg when Cutie was born. But once he accepted them, he loved each of them loyally. He was the most tolerant dog you could ask for. These kids climbed on him, tugged on his ears, and patted him a little too hard. If he didn't like it, he would simply walk away. And the kids knew that was his sign that he didn't want to play. They respected each other. Jake loved all the kids, but he and Bubs had a special connection over the years. The past couple of years Bubs had even taken over the duty of feeding Jake every morning and night. 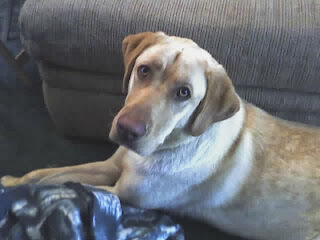 Jake looked to him as a caregiver. They definitely had a special bond. As the years went by and we had more kids (and more chaos), I found myself spoiling Jake less and getting frustrated with him more. He was always getting in my way, and I'd frequently find myself tripping over him. Of course, as any good dog, he was always at my heels. Also, not only did I have to clean up after the kids, but I also had to sweep more often when he would shed. When he was outside, he would bark at every little noise, adding to my auditory overstimulation. We would have to clean off his muddy paws on rainy days so he wouldn't track mud through house. As I was looking through pictures last night, I found fewer and fewer of Jake as the years went on. In fact, I remember getting frustrated when he would get in the way of pictures I was trying to take of the kids. So there were gradually fewer and fewer pictures of him. Something I now regret. But then there were the times he made me feel safe. I knew his bark at a squirrel was different than his bark at someone coming up the driveway. If I heard a strange sound, I would look to him to see if he was reacting. His response gave me security. He would hang out in whichever room we were in, just to be near us. As he got older, his energy level declined, so he mostly would find a spot to lie down and keep us company. Tonight we feel a void having no dog lying at our feet or by our couch. About a year ago we started noticing small lumps in a few places on Jake, but the vet told us they were just fatty tumors that dogs sometimes get. They don't really do much for them, especially if they aren't causing any pain or discomfort. Well, Jake didn't seem to even notice these lumps were there, and they didn't slow him down. So we carried on. About a month ago, the lump in the middle of his back grew quite rapidly to about the size of a basketball. We joked that he looked like a camel. The lump went from small, soft, and squishy, to large, hard, and tender to the touch. The vet wasn't sure what this lump was and offered to perform exploratory surgery. But he would be 11 in two months, and his body may not even handle the surgery. Plus he would have to go through a recovery process. Not much fun for an old dog. Not to mention to the other various lumps and skin growths that have popped up over the past few months. We thought about waiting until after the holidays to make a decision, but this past weekend, he started showing signs of being ready to go. It was a quick decline, and I worry that if we had waited much longer, he would have suffered even more. With a heavy heart, we decided to have him put to sleep. I had to convince myself over and over again that this was the right decision for him and for our family. Making the decision to take a life, especially the life of a loved one, is not an easy task. Then to watch it happen is even more difficult. It truly was peaceful for him, but it is still quite painful for me. But I wanted him to die knowing we were there with him through the whole thing. We will miss him dearly! There are so many great stories to share, and tonight we took some time as a family to remember all the good, funny, and crazy things Jake did. He truly was the perfect family dog. 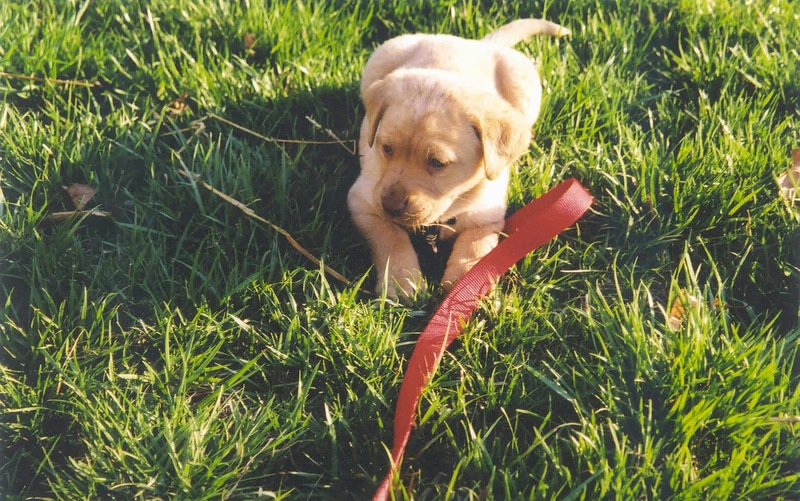 He was well trained, gentle and loving, and didn't get into any trouble (once we were through that puppy stage, that is). We were even able to leave out Santa's cookies on the fireplace hearth each Christmas Eve without him disturbing them. The kids asked if we can get another dog sometime. He is simply irreplaceable, and I'm not sure another dog will live up to his legacy. The kids handled the news quite well. We have been talking about Jake being sick (not the kind of sick we get) and about him getting ready to go to heaven soon. They've seen his lump grow and watched him struggle. And kids just deal with these things differently. I'm sure their grief will manifest itself somehow over the next several days and weeks.. I printed a collage of pictures of Jake for each kid to have so they could look at it whenever they feel sad or miss him. Looking at pictures of him now as I type this makes me sad, but I know the pain will ease and we will enjoy his memory for years to come.